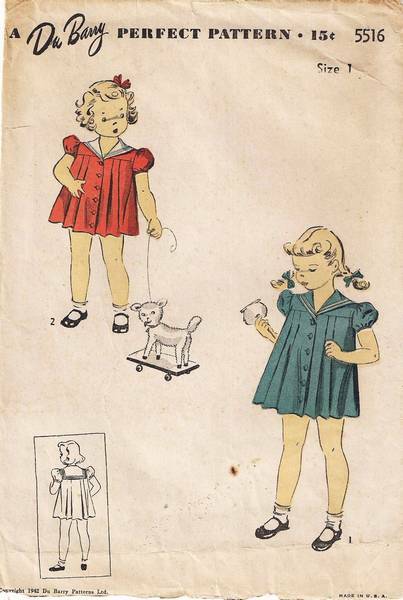 Vintage DuBarry sewing pattern, copyright 1942, with charming graphics so typical of the 1930's and 1940's. This dress is pleated front and back and joins to a yoke at the upper edges. Dress buttons down the front below the sailor collar. Short puff sleeve are bound at lower edge. Child's Size 1; Breast 20; Waist 19.5. Pattern is used and complete. Envelope and contents have age toning. Contents are neatly folded and not damaged but do show their age. Envelope is torn along the bottom edge, as shown.